A source close to the Miami Marlins' front office denied a report that surfaced Tuesday linking the Phillies and general manager Ruben Amaro Jr. to outfielder Giancarlo Stanton. CBS 3 Eyewitness News co-anchor Chris May tweeted Tuesday morning that a report from 610WIP claimed the Phillies were "aggressively pursuing" Stanton. Similar rumors circulated in December but were unfounded. Stanton, 23, hit .290 last season with 37 home runs and 86 RBI. Though a great fit, Stanton's trade value is far too rich for the Phillies. 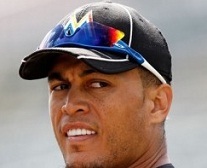 The organization has just two prospects in Baseball America's top-100 list and likely do not have the pieces the Marlins would be asking for if Stanton truly was on the market.